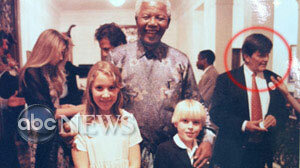 Jeremy Ractliffe is seen at right at Nelson Mandela's house the night of a dinner that included both model Naomi Campbell and former Liberian president Charles Taylor. Ractliffe has confirmed Campbell's story that she gave him three uncut diamonds that were given to her by men she believed to be representatives of Taylor. Jeremy Ractliffe, the South African who once directed Nelson Mandela's children's charity, has confirmed that he received three uncut diamonds from supermodel Naomi Campbell in 1997. South African police say Ractliffe brought them the gems Thursday. During testimony at the war crimes trial of dictator Charles Taylor, Campbell said that two men she believed to be representative of the warlord had given her a pouch containing several "dirty-looking" diamonds, and that she had give the gems to Ractliffe so he could sell them and use the money for the Nelson Mandela Children's Fund. Campbell had previously denied to ABC News that she received any gems from Taylor. In a statement released Friday, Ractliffe said that he had received "three small uncut diamonds" on Sept. 26, 1997. "I took them because I thought it might well be illegal for her to take uncut diamonds out of the country," explained Ractliffe. "Naomi suggested they could be of some benefit to the Nelson Mandela Children's Fund, but I told her I would not involve the NMCF in anything that could possibly be illegal." "In the end I decided I should just keep them," said Ractliffe, who felt that it was in the best interest of NMCF, former South African president Mandela, and Campbell, "none of who were benefitting in any way." Ractliffe told ABC News he gave the diamonds to South Africa's special police, known as the Hawks, on Thursday. On Friday, a spokesman for the Hawks told South African media they had received the diamonds and were having them authenticated. Prosecutors at Taylor's war crimes trial claim that the former Liberian president was in South Africa in 1997 to trade uncut 'blood diamonds' for weapons that he then gave to Sierra Leonean rebels. Taylor is being tried on charges of fueling the long and bloody civil war in Sierra Leone. Taylor has denied giving diamonds to Campbell. In a statement to ABC News, Taylor's defense attorneys continued to dispute the story. Said attorney Terry Munyard, "If the court finds that these things were diamonds and they were the gift of Mr. Taylor and therefore says he also bought arms and ammunition for Sierra Leonean rebels on that trip to South Africa, the defense says no competent criminal court could possibly make such a huge leap from one small fact to another." Prior to her testimony Thursday, Campbell had told ABC News that she never received a diamond from Taylor. She reluctantly appeared at the Special Court for Sierra Leone in The Hague to give her version of events the night she met Taylor at the home of Nelson Mandela in 1997. She arrived at court under police protection, and said during testimony that appearing was an "inconvenience" for her. On the stand, Campbell claimed two men came to her room at Nelson Mandela's residence in the middle of the night after a dinner at which she'd met Charles Taylor for the first time. She says the men woke her up, said "A gift for you," and handed her a pouch with several "dirty-looking" stones inside with no note or explanation. She denied that she had been flirtatious with Taylor at dinner or had been seated next to him, or that he had told her he planned to give her a gift of diamonds. She said she had not been in contact with him since the dinner. She said she had given the stones to Ractliffe in hopes they could be used for charity. "I just said take them, do something with them, make sure some children benefit from them," she told chief prosecutor Brenda Hollis. Campbell said that Ractliffe told her he did not have time to sell the stones, and that he still has them. Campbell was subpoenaed by the international tribunal following an ABC News report about allegations that Taylor had given her the uncut "blood diamonds". Until the ABC News report, Campbell had refused to cooperate with the court. Taylor is charged with 11 counts of war crimes and crimes against humanity. Campbell testified Thursday that she had never heard of Taylor, Liberia or blood diamonds when she met the Liberian president in 1997. CLICK HERE to follow the ABC News Investigative Team on Twitter. The prosecution first learned of the alleged gift of "blood diamonds" from actress Mia Farrow, who had accompanied Campbell on the 1997 trip and was a guest at the Mandela home the night the diamonds were purportedly offered. After an ABC News report on the alleged gift, Campbell's former agent Carole White came forward and told prosecutors that she was also at the dinner, and was with Campbell later that evening when a group of Taylor's men delivered a half-dozen uncut diamonds. Campbell was "disappointed" by the stones, according to White's lawyer Daniel Bright, because they were not yet cut to sparkle like the diamonds used in jewelry. Both White and Farrow are scheduled to testify after Campbell. Farrow told ABC News that she saw Campbell the morning after the dinner. According to Farrow, Campbell was "all a-twitter" when she recounted how she was given "a huge diamond" by Taylor's men in the middle of the night. In court Thursday, Campbell denied discussing the size of the diamonds after receiving them. She said she had breakfast with White and Mia Farrow the morning after receiving the pouch, and that one of the two women suggested to her then that the gift must have come from Taylor because no one else at the dinner would've given her such a gift. When ABC News asked Campbell about the incident at New York Fashion Week in February, she denied ever having received a blood diamond. "I didn't receive a diamond and I'm not going to speak about that, thank you very much. And I'm not here for that," said Campbell. She stormed out of the interview, slapping a producer's camera. Less than two weeks after ABC News aired the report about the alleged blood diamond gift, Campbell appeared on Oprah saying that she "did not want to be involved in this man's case," but she did not confirm or deny receiving a diamond. "He has done some terrible things and I don't want to put my family in danger," Campbell told Oprah and her millions of viewers in early May. Campbell's lawyer, Gideon Benaim, said that she is only a witness at Taylor's trial, and it is not alleged that she has done anything wrong. "Naomi has not done anything wrong. She is a witness and not on trial herself," said Benaim. Taylor has been on trial for almost three years at the U.N.'s Special Court for Sierra Leone, which is being held at the World Court in the Netherlands, and has pleaded not guilty to all charges against him. The warfare in Sierra Leone, where diamonds were used by African rebels and allegedly by Taylor to raise money for a bloody rampage from 1997 to 2001, killed or maimed tens of thousands. Taylor's lawyers have argued there is scant direct evidence that connects Taylor to the diamonds or the atrocities. "The issue here is not whether such atrocities were indeed committed but who was responsible and specifically was Charles Taylor the person responsible," Courtenay Griffiths, Taylor's lead counsel, told ABC News. Taylor has angrily denied dealing in blood diamonds. When pressed on the stand in November by Brenda Hollis about whether he sent his men to give a diamond to Campbell, Taylor called the allegation "total nonsense."